Lieutenant-Colonel Yacouba Issaac Zida (C) leaves the Place de la Nation square on October 31, 2014 in Ouagadougou after the resignation of Burkina Faso's President Blaise Compaore. A lieutenant colonel in Burkina Faso's presidential guard has declared himself the new head of state. Yacouba Issac Zida said Saturday in a statement broadcast on the radio and posted on the Internet that he is assuming the "responsibilities of head of this transition and head of state to guarantee the continuity of the state." The president of Burkina Faso, Blaise Compaore stepped down after protesters stormed parliament and set the building ablaze, ending his 27-year reign and sparking a struggle in the military for control of the West African country. On Friday Zida, representing a group of junior army officers, said the group had "taken the destiny of the nation in hand" while the constitution was suspended and a transitional government was in formation. But earlier Friday, General Honore Traore, head of Burkina Faso's military, said he was assuming "responsibilities as head of state." Burkina Faso's military chief General Honore Traore speaks at a news conference announcing his takeover of power, at army headquarters in Ouagadougou, Oct. 31, 2014. 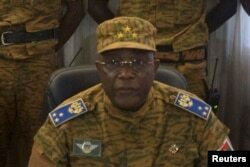 It was not immediately clear if Traore accepted Zida's announcement Saturday or whether other army officers had approved Zida's move to become the new head of state. In resigning Friday Mr. Compaore had called for a 90-day transition period leading to elections. He ruled the country for 27 years after seizing power in a 1987 coup. Unrest had broken out Thursday as lawmakers prepared to vote on a constitutional amendment that would have allowed Mr. Compaore to run for another term. The government withdrew the amendment after protests became violent.